West Basin, a wholesale water agency that provides imported drinking water to nearly one million people in 17 cities and unincorporated areas in Los Angeles County, and is an industry leader in producing recycled water, today announces the District has reached a milestone of producing 200 billion gallons of recycled water. The West Basin Municipal Water District recently announced achieving the milestone of producing more than 200 billion gallons of recycled water since opening its first facility in 1995. “As a pioneer of fit-for-purpose recycled water within the industry, West Basin remains committed to the growth of our recycled water program and water reuse within the State of California,” said Donald L. Dear, West Basin Board President. West Basin Municipal Water District (West Basin) is a wholesale water agency that provides imported drinking water to nearly one million people in 17 cities and unincorporated areas in Los Angeles County. West Basin is also an industry leader in producing and delivering recycled water for more than 300 sites with 400 connections, and has now achieved a major milestone of producing more than 200 billion gallons of recycled water. During the drought of the late 1980s and early 1990s, West Basin responded to the need to create a new, sustainable water supply and committed to building a world-class, state-of-the-art water recycling facility in the City of El Segundo. 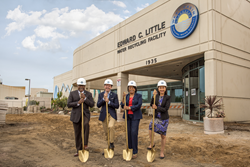 In 1995 the District opened its high-tech Edward C. Little Water Recycling Facility (ECLWRF) to further purify already treated sewage, which West Basin purchases from the nearby LA Sanitation Hyperion Water Reclamation Plant. Today, the ECLWRF and West Basin’s three satellite treatment facilities produce five types of customer-tailored recycled water using advanced treatment technologies, a process that prevents more than 12 billion gallons of treated sewage from being discharged into the Santa Monica Bay each year. West Basin’s water recycling program provides many benefits to the communities it serves. Every drop of water recycled by the District is a drop of drinking water conserved for homes and businesses. To date, the District conserved enough drinking water to provide for 5.5 million people for one year through its water recycling program. West Basin is the only water agency in the world to produce five types of custom recycled waters to meet the specific needs of public, commercial and industrial users. Its recycled water program operates across four treatment facilities located in El Segundo, Carson and Torrance with more than 120 miles of recycled water pipelines. West Basin continues on its path to reaching established recycled water production goals of approximately 70,000 acre-feet per year and realizing full capacity of the ECLWRF. The average daily delivery of recycled water is currently about 100 acre feet. The District’s five types of recycled water serve customers for multiple purposes including: irrigation, industrial cooling towers, high- and low-pressure boiler feeds, as well as seawater barrier and groundwater replenishment. West Basin treats and purifies water that the Water Replenishment District of Southern California (WRD) injects into the West Coast Basin Seawater Barrier (Barrier). This Barrier water has the dual benefit of preventing seawater intrusion into the groundwater basin, and recharging the aquifers with purified recycled water instead of precious drinking water. West Basin also has other valued regional partners that contribute to the growth of its recycled water program. Since 1994, the District has worked with the U.S. Army Corps of Engineers to expand the availability and use of recycled water in the South Bay region of Los Angeles County. Currently, the U.S. Congress is considering a bill that would authorize increased funds for recycled water projects in the District. West Basin has invested approximately $600 million in infrastructure and treatment technologies for its water recycling program and has obtained roughly $277 million in grants and outside investments to assist with program costs. Today the District continues its system-wide Capital Improvement Program (CIP) and refurbishment and repair program, which enables West Basin to reach new milestones for production and ensure reliability. The CIP allows the District to support future customer demand; safeguard system capacity and reliability; meet water quality obligations; and respond to changing regulatory requirements. West Basin also recently broke ground for the renovation of the ECLWRF visitor and education center. Since its opening in 1995, more than 100,000 people, including local school children, college groups, international delegations, trade groups and professionals, have visited the facility. The renovated center will feature new content, displays and exhibits that will better enable the District to help educate the approximately 6,000 students and guests that tour the ECLWRF each year. The center will further reinforce the West Basin mission and increase awareness of water-related issues in the region. The visitor and education center is anticipated to re-open to the public in summer 2019. For more information about West Basin, please visit http://www.westbasin.org. West Basin Municipal Water District (West Basin) is a wholesale water agency that provides imported drinking water to nearly one million people in 17 cities and unincorporated areas in Los Angeles County. West Basin is an industry leader in water conservation, recycling and education. The District is implementing a Water Reliability program to reduce the agency’s dependence on imported water and develop local, drought-proof water supplies. This includes water conservation, recycling, groundwater desalting and the exploration of ocean water desalination. Visit http://www.westbasin.org to learn more.